Turquoise Bay Dive and Beach Resort on Roatan’s northeast coast and Subway Watersports, the on-site dive operation for Turquoise Bay, recently celebrated the three-year anniversary of the installation of the first coral nurseries in the Bay Islands of Honduras. Turquoise Bay and Subway have been growing and planting Staghorn and Elkhorn corals back on Roatan’s reefs to counter coral diseases and multiple other stressors including climate change, untreated sewage, overfishing, and land-based runoff. After growing these corals for six months to a year in their off-shore, mid-water coral tree nursery, they plant healthy corals back on the reefs around Roatan. When these corals grow up and spawn shortly after the full moon in August, the nursery-raised corals will contribute their resilient genes to the next generation of these vital reef-building corals. Subway has involved more than 50 Go Pro Green PADI Divemaster interns along with and 150 resort guests to maintain the coral nurseries and outplant nursery-raised coral. So far, participants have transplanted over 500 corals back onto Roatan’s reefs, and monitoring indicates that more than 80 percent of these corals are healthy and securely attached to the reef. Building on that success, Subway Watersports and Mayan Divers have joined forces to install a new coral nursery at the SeaQuest Deep dive site in West Bay, Roatan. 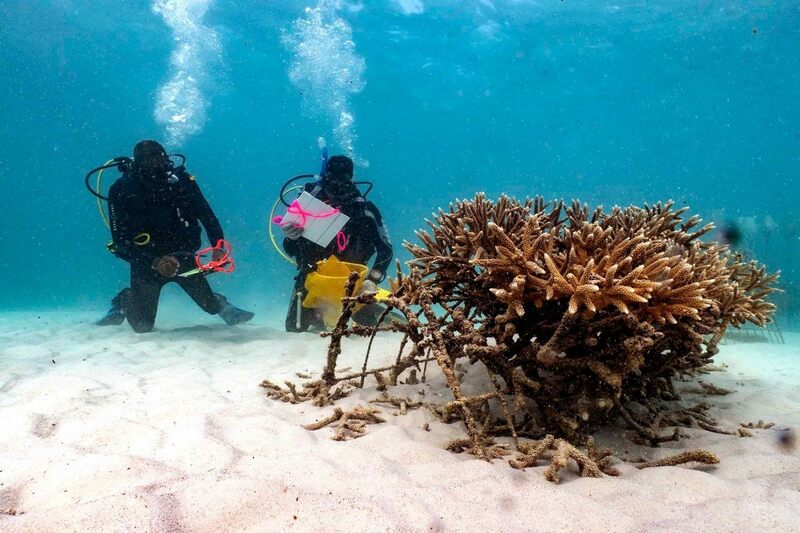 On March 5, 2019, Mayan Divers staff and Subway Watersports Go Pro Green Divemaster candidates installed four new coral nursery trees on a sandy patch on the reef near SeaQuest Deep. A one-year grant from the conservation organization MAR FUND will pay for a total of 1,800 corals in 30 coral nursery trees at SeaQuest Deep. Subway Watersports and Mayan Divers are also now offering a PADI Distinctive Specialty Course in Coral Restoration. PADI recently approved Tripp Funderburk, the Coral Restoration Manager for Subway Watersports and for Mayan Divers, to teach the Bay Islands Reef Restoration Coral Restoration Distinctive Specialty course, which Funderburk personally developed. The course includes lectures on basic coral biology, coral stressors, and the theory and techniques employed in coral restoration programs. It also includes two open-water dives to teach students how to maintain coral nursery trees and outplant nursery-raised corals onto the reef. A group of 18 students from the Blue Endeavors ocean conservation program were the most recent certifications in the new course. If you want to get involved in restoring healthy coral colonies to Roatan, contact Funderburk at [email protected].